Burning Man’s founder Larry Harvey speaks to the Commonwealth Club in 2011. This is a fascinating and thought-provoking interview. The interviewer knows how to offer the tiniest possible amount of prompting, to elicit great responses from Larry. The audience seem spellbound, and Larry’s on fire compared to his form in Washington. Sure, at times this blog has been critical of the BMOrg. Hell, we have a whole category dedicated to snarky posts: our Complaints Department. This is not just complaints for their own sake, or to stir up Web traffic – we feel that improvement is unlikely to happen without continually re-testing the underlying assumptions. AKA “a squeaky wheel gets a greasing”. Let it be said on record that we consider the founders of this event to be amazing people, who have contributed an enormous amount to the world, and deserve the gratitude of all Burners. We extend that to all the founders, including all the Burners who made the art and made the experiences and created the party. Especially those who are not professional artists, but somehow this forum has encouraged them to express themselves artistically anyway. In a multi-disciplinary fashion, as Larry discusses here. Watch this interview and you’ll realize that this is someone pretty special in the world. 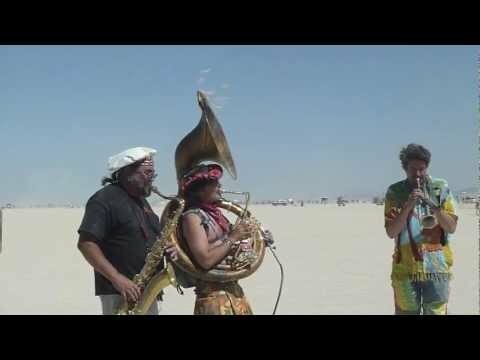 Of course, giving BMOrg some props doesn’t mean that we have changed our position that Burning Man should embrace change, remix as times go on, and broaden the community, rather than “we innovated once, now let’s maintain the status quo forever and keep it small and exclusive for a hundred years”. Downtowns were destroyed. Ghettoized. Crack was sent in, thugs and hookers started appearing on street corners. Windows were smashed, then barred, then smashed again. Graffiti was tagged over graffiti, trash piled up in the streets. Then, slowly, over decades, the derelict ghettos were rebuilt. Artists came in, and with them, the gays. The warehouses became lofts, the crackhouses became bath houses. The gays brought the hot girls. Models, stylists, waitresses, clubbers. The advertising and magazine industry. Art begets fashion, which begets “edgy” wealthy patrons. The gays have more money (and better drugs), the art patrons have more money, all this attracted the hot young talent wanting to be in the “scene”. The presence of these ingredients brought the cool straights, the pioneers not afraid to venture out into alien territory on the hunt for strange prey. The more popular the scene became, the more cool these straights thought they were. They boasted to their friends, of a fairy land of art and models. “In the ghetto?” their friends retorted, only to learn the ghetto was changing. It was now the Place To Be. The straights brought other straights, pioneers and early adopters for the mainstream. The newspapers started writing about it. It started to get mentioned in newspapers in other towns, in travel guides. Slowly, the area crossed the chasm and then sports stars and Reality TV “celebrities” were sighted there. Most of the artists and queens moved on, just as the crackheads and bums had before them. Real estate values changed from the lowest per square foot, to encroaching on the highest. Gentrification was complete. This has been occuring over the last few decades in the Downtown LA Theater District, New York’s meat packing district, Detroit; in San Francisco, it has happened in SOMA, you can see it going on in the Mission, and Burning Man and the Mayor are trying to do it in the Tenderloin. Their new offices are at 8th and Market – historically, not a great part of town, but transforming rapidly under Chinese Mayor Ed Lee. We’re not knocking gentrification – at Burners.Me we are all for evolution and continuous improvement. We’ll take the arty gay scene full of models over the ghetto full of crackheads, any day. 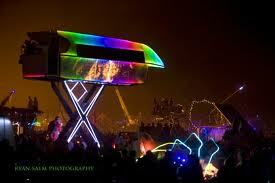 If Burning Man is the thing to transform a ghetto into hipster utopia, we’re all for it. The 10-story skyscraper he mentioned was Vertical Camp. B*A*D* A*S*S.
“At a certain point in a community when everyone is giving, people begin to have experiences that are simply revelatory, they begin to feel that their life is filled with meaning. They begin to feel that they’re in touch with that unconditional reality which perhaps in their youth they identified as life’s goal, when they thought the world might be like their family, and then later discovered it wasn’t. It creates this world which is saturated with meaningful encounter. And it seems to have been contagious because people now for years have left our event and they’ve gone back to the world and they weren’t willing to stop being that way, they continued to do those activities; they didn’t go to a festival and sate their appetite, they went to a festival and came back trying to change the world. 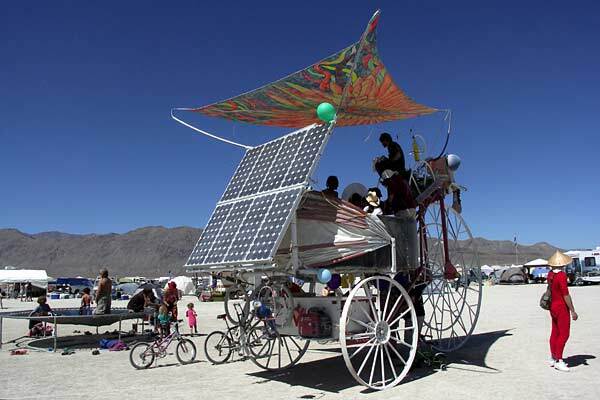 And that’s why we started this Burning Man Project, we think there’s a lot we can do together. The guy is a sage, that’s for sure. And he speaks pretty humbly, all things considered. …WTF – Larry you’re losing me with this argument. 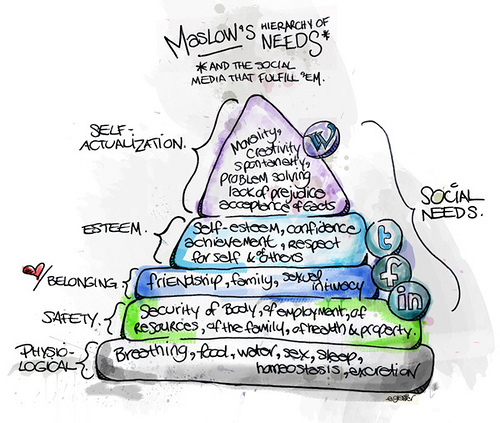 If you care about the safety and well-being of the community, then meet the lowest level of Maslow’s hierarchy of needs. You should sell water, food, lights, condoms, blankets, sunblock, and yurts. Oh, and toilet paper and hand sanitizer – anyone ever been in a Portapotty on Sunday, when everything has gone? Meet the most basic needs of the community. Provide somewhere that people can go to in the case of emergency, or that the darktards can visit without feeling foolish. Maybe in the Burner Strike dungeon. The problem with line drawing is it’s a slippery slope – who draws the lines, and if you’re excluded, what can you do to be included? If you draw the line, then turn a blind eye when your colleagues and friends cross it, it will breed resentment in the people towards the hypocrisy of their leaders. Does “radical self reliance” mean it’s fine to be a darktard, as long as you survive? Methinks, not. “Lift your game, dickhead!” would be the Burners.Me suggestion. We prefer radical inclusion, find a way to embrace what the diverse factions within the community want, instead of playing whack-a-mole chasing sinners against the cult. But if they’re acting in a less than optimal way, there should be some social conventions, perhaps even a camp or two, where we can give them a chance to learn and choose to remake themselves as a true Burner, cognizant of the consequences of their actions. They can be reformed as a Former Darktard, and spread the light to Virgins. …”To the extent that Art has spiritual work, it contemplates the unknown. TV shows, sitcoms, ads, look for the unknown you won’t find it. Art is about what is unknown, what must emerge from us, and what must be found by us, and discovered. So art is a wonderful breeder of that, because often times people are doing things that in fact are on a frontier of some kind, no-one ever did this, they go well beyond any industry standard you can think of. There’s something about the culture we’ve originated that’s radically cross-disciplinary”. Great challenge. I mean it – a truly cutting edge, intellectual and sociological challenge. An historical challenge, even. So why not use the technology of the 21st Century that San Francisco leads the world in – such as Social Media, crowdsourcing, big data, advanced mathematics, Creative Commons – to tap into the intellect of the 350,000 strong Burner community, which includes pretty much all the people who created those technologies? The Burner community includes people like Matt Groening and George Meyer, Elon Musk, Google, and David Chiu. You want to really leave a legacy? Make the phenomenal idea you had (or should I say, “inherited” from the Cacophony Society) your legacy: “the people make the party”. For sure, you created the context, you took the risks and managed the logistics and you got the authorities on side. You fought the legal battles and the Law Enforcement Officers, you lobbied the politicans and created innovative ticketing systems and doled out some Art Grants along the way. But don’t discount the contributions of tens, even hundreds of thousands of Burners over 25+ years. They had to do many of those things too. OK, we get that you made the party by picking the themes, creating the context, banking the money. Finding the insurance company to underwrite this – I’m sure no easy task. So after all that, you’re going to make the legacy too. Fair enough – it’s your right, as founder and owner of “That Thing In The Desert” – but we encourage you to consider the bigger picture, the highest realization of your Self, a selfless legacy that truly Gives. The gift (to Burners, to Art, to humanity) that keeps on giving.